I see the German magazine Bild reckons that Heikki Kovalainen was only McLaren's third choice of driver after Alonso's departure. Rosberg and Vettel were approached first but both had rock solid contracts, apparently. It is vaguely interesting that there is no mention of Adrian Sutil, another hotly-tipped candidate for the seat, but note that all the suggestions are German drivers. This may be coincidence but no doubt we are supposed to see the hand of Mercedes behind the scenes. We are even told that Vettel was Norbert Haug's idea. I am sure such stories suit Bild's readers but, personally, I doubt the whole thing. It is almost certainly true that McLaren were interested in Rosberg and probably tested the waters at Williams; hence Sir Frank's public assurances at the time that Nico was staying with him. But Vettel? I find that just as unlikely as the Sutil option. Both are unproven rookies, Vettel even more so than Sutil, and it is just not McLaren's style to take chances with driver choices. Hamilton was an exception but was also a special case. He had been groomed for years for the job and seemed ready to tackle F1. Even so, it was a while before Ron Dennis finally made up his mind. It might be thought that the team were encouraged to take more chances after seeing how well Hamilton performed last year but there is a limit beyond which McLaren will not go. If the choice is between a driver with a proven record or one with a reputation but not much else, they will take the one with the record. Rosberg was the one with most credentials and I would think they approached him first. But Kovalainen must have been on the short list from the start and was a natural choice when it became clear that Rosberg wasn't moving. Also in the news is the fact that McLaren suffered a financial loss last year, blame going on decreased sales of their version of the Mercedes SLR and the departure of sponsors. Bearing in mind that they still have to pay off the $100 million FIA fine, it is quite likely that the team was not prepared to pay the asking price for any of the suggested replacements for Alonso. This again would have helped Heikki's cause. And it seems that McLaren have ended up with as good a driver pairing as they could have hoped for. Kovalainen has been impressive in testing, much more so than I expected. There are probably all sorts of reasons why Hamilton has tended to trail the Finn in the times so far but there is still ample proof that Heikki is fast enough to warrant his drive. So things may be looking up for McLaren, on the track at least. Although Trulli has restated his opinion that Ferrari are way ahead of everyone, others are not so sure and most of the indicators point at there being little to choose between the two usual contenders. Ferrari are better on long runs, it seems, while McLaren have the edge over shorter distances. Which means that Hamilton and Kovalainen might be grabbing some pole positions. Last year that would have guaranteed them some wins but now traction control has gone and nobody is quite sure that grid position will be as important as it has been. We shall see. In testing at Barcelona today, Hamilton was quickest, confirming the speed of the McLaren. Right behind him were the two Ferraris of Raikkonen and Schumacher - the expected contest settled in favor of the new champion. And next up was Nakajima, followed by Heikki and Nico Rosberg; yet more evidence of how good the Williams pairing is too. It really is shaping up to be a fascinating season. just a bit confused reading this. how is kovi any more proven than sutil? they both debuted at the same race. neither has won a gp or secured a pole. in fact, at the beginning i'd say sutil did a better job. I wouldn't disagree that Sutil did a better job at the beginning of the 2007 season, Sidey - he quickly put Albers in his place. But over the whole year, Heikki was more impressive, I think. He had a much more experienced team mate to beat and did so convincingly in the end. "Interesting that Adrian has that same experienced old fart to beat this year." good point sir, good point. Is it possible that the Kovi and Alonso swap isn't just a coincidence, and that it was part of the deal that let Alonso out early? If the rumours that Alonso felt threatened by Kovi, then Ron Dennis may have made a shrewd decision. It does make sense that Haug/Mercedes would have wanted a German driver, after all, they did go after Schumacher (although I don't for a minute believe Dennis when he says he doesn't remember the year). Aldo Costa of Ferrari today said that he's worried about reliability, and that may be the deciding factor: Between two fastest cars and greatest drivers, whoever finishes the most will win. 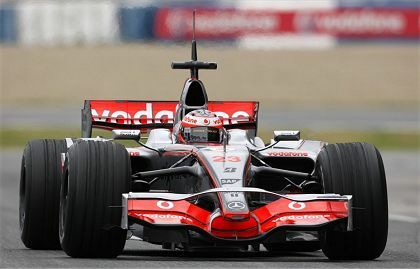 Kimi sure had a lot of bad luck at McLaren, but they seem to be on top of it now. We'll see if the new team at Ferrari can continue their winning ways, or if they are headed back to the way they were in the 90's. F1 Minute: It's possible, yes, but I don't think it's likely. Why would Ron delay the announcement of Heikki taking the seat so long after Alonso left, if it was a done deal? It just feels right that Ron would keep his options open until he knew exactly who was available and who wasn't. If and when Mercedes take over McLaren outright, then I can see them leaning towards German drivers. Until then, I don't think they'll do much more than make occasional suggestions. Clive, I hardly think that Haug is silent when it comes to picking drivers. I'm not saying that Dennis isn't the final say, but I'm sure Mercedes was urging him to poach Schumi. And the approach that I remember reading about was when he was at Ferrari, and it was around 2000, although Dennis claimed it may have been before or after. You're probably right, Arnet - I missed that snippet of news at the time and am going on the way Haug seems these days. It looks as though there is little interference from Mercedes but I have no idea what goes on behind closed doors. I wouldn't say that Ron has an iron fist, but I'm sure Alonso isn't the only one to have experienced his, erm, making his point? Judging from what Alonso and other drivers have said, Ron has a surprisingly laid back style - he doesn't seem to be a Patrick Head, for instance. If you're out of Ron's favor, he just ignores you! I think your scepticism about Bild is well-founded. I'd be surprised if Kovalainen wasn't their top choice, though, as he seems such an obvious fit for the team. Regarding Vettel, it was public knowledge even before he drove for BMW at Indianapolis that he was contracted to Red Bull from 2009. And Rosberg looked in greater danger of ending up at Toyota than McLaren. Well, I think Arnet was right. After all, Schumi WAS previously contracted to Mercedes before he entered F1, and he should have ideally been leading their charge to their first title since 1955. But Schumi has gone on the record saying that while he and Haug got on well, Ron Dennis was another matter entirely, and could have been the reason why he didn't go to Woking instead of Maranello. Just to add to what Ali said, McLaren first approached Schumi in 1995 (along with Benetton, Williams and Ferrari) in a bid for his services for 1996 onwards (as he had no contract after 1995). Although McLaren ended up as one of the two final choices, they lost out to Ferrari during the summer of 1995. The 2nd attempt was in 2000, when they sensed that Schumi was starting to get frustrated with not winning any titles at Ferrari. It was rumored that the deal involved a straight swap - Schumi to McLaren, Mika to Ferrari. But there were some hitches during negotiations - most notably Ron Dennis' insistence on no personal sponsors. By the end of that season, Schumi and Ferrari won both titles, and that pretty much ended any McLaren bid to ever get Schumi for the future.